David Haye is convinced he will go on to rule the world heavyweight scene after first cleaning up the cruiserweight division later this year. Haye, 26, marked his heavyweight debut with a first-round knockout of Tomasz Bonin at Wembley Arena on Friday. But negotiations to meet the WBC and WBA world cruiser champion Jean Marc Mormeck are already under way. 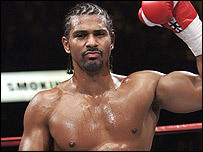 "I'm absolutely certain I can rule the heavyweight roost, my power has gone through the roof," said London's Haye. "I'm faster at heavyweight than I was two years ago at cruiserweight and I was always a quick cruiserweight. "If any of the heavyweight champions had been in there with me the other night I would have knocked them out. "Even against the bigger guys it will be the same - Mike Tyson was only 15 and a half stones but he had the speed to dominate." Next week Haye and his promoter Frank Maloney will head to the United States on a publicity drive aimed at courting television networks HBO and Showtime. Haye's showdown with Frenchman Mormeck, who is promoted by Don King, is likely to take place in the autumn with the location of the fight the main area of contention. The winner is likely to face Jamaica's former undisputed cruiserweight champion O'Neil Bell and Maloney believes Haye can emulate Lennox Lewis' success Stateside. Maloney said: "David has tested the heavyweight division but he is a cruiserweight and will be going back down to challenge for the WBC title. "The plan is to win that, make a couple of defences and then step up to heavyweight again. "We'll go to New York to meet with a number of people, including Showtime and HBO. "We'll present them with tapes of some of David's knockouts because we all know that to be a real legend in boxing you need to conquer the American market. "I believe it is crying out for someone of David Haye's personality. "I still don't think people realise the potential David has and what he can do over the next five years. "We talk about the sort of money footballers can earn but if David Haye dedicates his life to boxing for the next five years I believe he will be the wealthiest sportsman that we've ever produced in Britain."